Postal tubes are the answer for shipping, transporting or storing any item which can be rolled. Our large cardboard tubes provide complete protection to their contents and you don’t have to worry about getting inconvenient folds or creases in valuable artwork, charts or other large documents. Our sturdy cardboard tubes for up to B0-sized documents; (1414 x 1000 mm or 55.7 x 39.4 ins) are an economical and lightweight postal solution, which can be used more than once. The postal tube is reinforced by plastic caps which slot snugly in the ends, holding rolled items in place and away from dust. Packing very large papers need not be tedious and stressful as you can use our lightweight, cost-effective B0 postal tubes – whether for secure shipping or safe archiving. These versatile biggest size cardboard tubes are available in a choice of 4 diameters, so you are sure to find a size to suit your needs. By simply rolling your documents, inserting them into the tube poster and snapping on the white end caps, your package is done and ready to go! The contents will stay safely in place, dry and clean until the packaging tube reaches its destination. What is more, our economical cardboard tube provides a professional look to your B0-sized documents. Items, which can be perfectly packed in our tube, include maps, calendars, plans, blueprints, posters and any pictures which can be rolled. 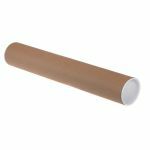 Made from rigid recycled cardboard, our large postal tubes are strong and sturdy, are supplied in packs of 10 and can be reused or recycled.